Andrea Hayes' husband has a resigned look on his face. It's the sort of look my own husband gets when I say I'm just going to have a 'quick look' at the shoe section or when I suggest a trip to Ikea might be in the offing. "It'll just take a minute," Andrea beams at him. "He's used to me," she smiles conspiratorially, as she shuffles Angel cards to give me a reading while David loiters in the Fitzwilliam hotel lobby. I'm actually not massively into Angel cards (although if the news is good - as it was in this case - I'll happily hear it), but there is something about Andrea that makes you want to buy whatever she's selling. 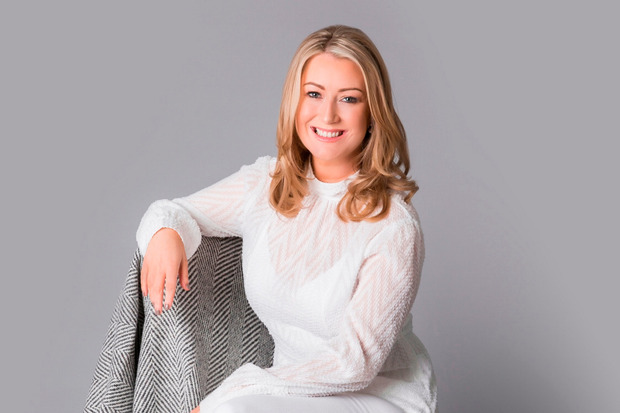 'Bubbly' and 'sunny' are the adjectives often associated with the smiley TV3 presenter, best known to viewers for her compassionate coverage on Animal A&E, Dog Tales and Coming Home for Christmas. Sometimes a TV persona can be at odds with what you get off camera, but Andrea is every bit as engaging in real life. If you subscribe to the theory that people are either drains or radiators - negative or brimming with life-affirming warmth - then Andrea is most definitely a furnace. "I'm the really annoying person who puts up inspirational quotes on their Facebook page," she chuckles. "I love Google Quotes." Those familiar with the 38-year-old's story will know that her relentlessly positive demeanour masked a life-time of chronic pain. In her best-selling book, Pain-Free Life, Andrea charted her experience of pain and the diagnosis of a rare brain disorder, Chiari malformation type 1. But her latest literary offering, My Life Goals Journal: Wellness Strategies to Transform Your Life, is a revelation in how those health problems forced her to re-examine every area of her life and realise that - despite the glittering career and picture perfect family - she wasn't happy. "I realised my life was just totally out of balance," she says frankly. "I didn't know where I wanted to go, so I had to decide what was going to make me happy again or what I wanted to achieve in life." Her job alone would have been enough for people to view her life as enviable. But, as a freelancer, she felt under pressure to say yes to any work that came her way, working until 2am or 3am to write pitches and papers. "I would work really, really hard but I would absolutely drain myself," she explains. "There was a cycle of boom and bust, crash and burn and that wasn't helping anybody." In January 2014 she started three months of leave. It was during that time that she realised she was "at breaking point". "I was hopelessly trying to stay afloat despite the tsunami of excess - too much pain, too much work, too much stress," she writes in My Life Goals Journal. "Life was becoming too much and I felt I was drowning." Not only was she worried about her health, but she was also dissatisfied by her work/life balance. She was grateful for her blessings, yes, but diet, weight, sleep, health - all needed an overhaul. We live in a society that values grit and determination, a 'try, try, again' mentality. And yet, as Andrea will testify, there's considerable power to be found in saying 'no' and letting go. "Letting go is massive," she says. "It's OK to say: 'That's not really for me any more.'" Despite the fear of work drying up or "thinking they won't like me", she started, and has continued to say no to jobs that don't resonate with her. She's quicker to discard relationships, objects and obligations that don't work for her. "Situations, relationships, jobs, hobbies and places all have expiry dates," she writes. "If something no longer feels good, don't be afraid to get rid of it. Sometimes by letting go we set ourselves free to explore and manifest brilliant new possibilities." In many ways her message reads like an ode to the myth of 'having it all'. This idea that, if you can achieve the Career, the Family, the Perfect Weight then you'll be a success and therefore content, has caused countless women to put themselves under pressure to 'do it all', with the result that they're left feeling burned out. Andrea was one of them. Her thinking behind the creation of My Life Goals Journal, is to help others take that mental step back and assess what they really want from life. Each chapter (it's broken into 12 months, but there are no dates - deadlines are just another unnecessary pressure) follows a set format of inspirational quotes, 'dares' to focus the reader on what they want to achieve and some insight into the science behind that month's topic, be-it conscious eating and healthy living, self-talk or stillness and sleep. Visually it's a big hygge of a book; beautifully illustrated with a warming message of putting the little things that make you happy at the centre of your life. At the heart of it, My Life Goals Journal is also a traditional diary, for readers to write down their thoughts and feelings, hopes and aspirations. Andrea's a big believer in the cathartic act of writing and her own journal entries included in the book provide an excellent insight into how to put the theory into practice. But she's insistent that what she's produced is a guide to developing one's own personal 'wellness strategies', not a blueprint. She does not, for example, suggest that everyone should follow her example on going vegan, trying herbal supplements or eschewing the brain surgery recommended for her condition. "I don't want to tell anybody how to live their life, because I'm no expert!" she exclaims. "I'm just saying this worked for me, maybe it might work for you too." I put it to her that, even if people might want to imitate aspects of her own experience - such as turning one's back on work, or even just scheduling a solo lunch date - many won't feel they've the resources to do so. Preaching the importance of 'me time' is all well and good, but surely it's a luxury not everyone can afford? "When you're faced with a rare brain disorder, money is very…" she tails off. "I left my job with no money and we struggled…not struggled financially…but I didn't have a salary coming in at all and I think again it was about getting that balance right, and my health just had to come first at that point in my life." When it comes down to it, she feels all of us can afford to prioritise a bit of time to ourselves to work on our mental wellbeing. "Making time for yourself is an act of self-love and about putting yourself first," she says. "Yes, you could be cleaning the house but why not do something that's going to make you feel happier inside?" she contends. Many of us place a huge premium on money, comparing ourselves to what other people have, and looking outwards for validation rather than inwards. To use one of Andrea's inspirational quotes: "Too many people overvalue what they are not and undervalue what they are." But 'self-love', positivity, wellness - it's not very Irish is it? As a nation we tend to value self-deprecation, dark humour and cynicism. No-one wants to be accused of having 'notions' - we're not bloody Americans. "Positivity is a word that annoys people, I know that, and what is 'the power of positive thinking'? It's such leafy terminology," laughs Andrea. "But ultimately, it's about controlling your thoughts and control of what's going on in your mind. Because the only thing we can control is how we think. "Maybe it's a cultural thing," she adds. "We're afraid to say we love ourselves and put ourselves first. You don't feel you can stand there and say 'I love myself' or 'I value myself' because people might think you're self-obsessed." I confess to her I cringed at her suggestion that everyone should be able to look in the mirror and say "I love you". Apparently it's a common reaction. Andrea works with Chronic Pain Ireland and in the classes she's led, her request for people to do this is regularly met with rebellion. But she asserts that she's happier - and healthier - since she learned to love herself. She turns work down, and has seen her wage drop, but feels better about the jobs she does engage in. In her freed-up 'me time' she's been able to pursue other interests, becoming a certified clinical hypnotherapist, a Bethany volunteer (supporting people in bereavement), a Reiki practitioner and a certified angel card reader. She's written two books. "I trust my inner knowing," she says. "And I know that sounds really airy fairy, but I did it with my health and it worked." She knows her book will attract the 'self-help' label but she's a fan of the genre, counting The Artist's Way by Julia Cameron, Esther and Jerry Hicks' Ask and it is Given and Louise Hay as self-help favourites. "I've always had to help myself sadly, because there's always been something I've had to help myself with," she explains. What becomes clear is that her own self-care journey has been a very personal one. Did other people feel shut out? "Probably, maybe, yeah I think so," she replies honestly. "There are some friends that I haven't seen as much as I used to see in the last year because I'm getting a little bit selfish. [But] If people aren't happy with this new me then I'm actually OK to let them go… with love, and acknowledge that's fine. Because I had to do this for myself, I'm happy managing my time a little bit better and prioritising what I need to." And that means also acknowledging that she's not defined by being a parent to her five-year-old daughter, Brooke. "If you'd asked 'who am I?' I would have said 'I'm a mother' but I'm not, I'm more than that… I didn't even remember who I was," she says. It has been a "revelation" to discover that putting herself first sometimes actually makes her a better mum and been a welcome relief to let go of the negative internal dialogue that plagued her parenting. "I'm so much happier with being a parent," she reveals. "I didn't think I was good enough, I didn't feel I was doing enough, around enough, loving enough and I was very hard on myself. One of the big turnarounds was to say 'I'm a good mother' and that took a lot of work. I could say it, but did I really feel it inside? There were a few things that happened when Brooke was born, I wasn't well, and I felt I wasn't there at the beginning. I carried that somewhere deep in my subconscious, that I wasn't good enough because of that. I had to take that back out and deal with it and kind of say, 'This is something I'm carrying, but is it the reality?' and actually the reality is my daughter's great and I'm doing the very best that I can and that's enough." David Torpey - who she married in 2007 - has been a source of support throughout, united in helping Andrea through health problems, encouraging her to spend time on herself and accepting of the positive affirmations that have been scrawled on rolls of Ikea paper and tacked on to full-length mirrors throughout their Shankill home. Despite being an atheist, he's supportive of her decision to return to church, accepting of the fact that Andrea's spirituality makes her happy. Seeing him indulgently stand by during our brief Angel Card reading was just a little insight into his obvious, enduring adoration for the woman he first met 18 years ago in Dublin nightclub Café en Seine. "I'm very lucky," she adds. "It's probably brought us closer together. We look on things as always having a solution - 'What's the worst that could happen?' - and for me that's death, so anything that's not that is all right." Despite being off medication for over six months, Andrea still has to factor pain into her day and has had some health issues that have prevented her and David from trying for a second child this year. She feels certain though that it's on the cards for 2017. "I absolutely believe it will happen (if it's meant to) and I do think it will happen next year for sure," she says grinning. "It would be amazing, but if it doesn't, we're really happy. I think I had quite a lot of pressure on myself before - maybe that I wanted to have another child to prove to myself that I was a good mum because I missed a bit of time out with Brooke - but that's not there anymore." Also pencilled into her own Life Goals Journal for January is the launch of the book and taking up an art class. Babies, books and brush strokes, I've no powers of prediction but I'll be sending out positive energy for her every success in 2017. Buy now from Gill Books.